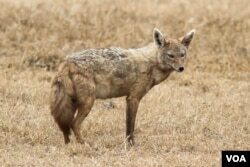 The hunting styles of man’s best friend evolved along with changes in habitats brought about by climate change, suggests a study of ancient canid fossils. In prehistoric times, canids -- carnivores that include foxes and wolves -- were tiny in comparison to modern dogs. "They were more like mongoose or something like that,” said University of Malaga paleontology professor Borja Figueirido. And their forelimbs were different. Figueirido studied the ancient fossil records of North American canids dating to 37 million years ago. Back then, he and his colleagues write in the journal Nature Communications, canids were ambush hunters, adapted to a forested habitat, stalking and pouncing on prey, much like cats. They had short legs and elbow joints that rotated, the better to wrestle prey to the ground. Chasing prey through the thick vegetation would have been very difficult, as trees, bushes and undergrowth would have gotten in the way. About 25 million years ago, the Earth’s warm, sticky climate began to cool and grow less humid, giving way to grasslands that more resembled the savannah in Africa. Fossils from this period show the development of stiffer forelimbs, better for running. Instead of stalking and pouncing, the dog's ancient forebears began to sprint and chase their prey in open fields. This transformation from ambush hunters to long distance predators began about 7 million years ago, according to Figueirido. By 2 million years ago, during the cooler and drier Pleistocene period, the ancestors of wolves and dogs were chasing their prey over long stretches. Studies have documented that changes in the foraging behavior and teeth of herbivores, like horses, coincided with alterations in habitats brought about by climate change. This is the first time researchers have tied changes in the size, build and hunting styles of carnivores, or meat eaters, to alterations in ancient habitats.